Fukuoka (福岡市 Fukuoka-shi) is the capital city of Fukuoka Prefecture and is situated on the northern shore of the island of Kyushu in Japan. Fukuoka hosts more than 2 million foreign visitors annually, with the majority coming from neighboring South Korea and China. Genko Historical Museum (元寇史料館?, Museum of the Mongol Invasion) – In Higashi Koen (East Park); displays Japanese and Mongolian arms and armor from the 13th century as well as paintings on historical subjects. 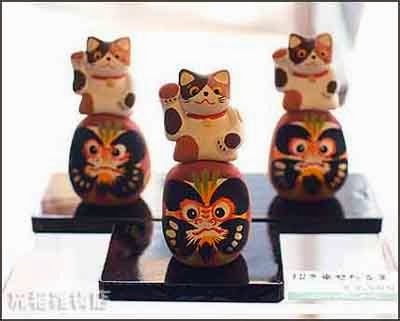 Open on weekends.
. oidashi neko 追い出し猫 cat to drive out illness and bad influence . On March 20, 2006, Amagi, along with the towns of Asakura and Haki (both from Asakura District), was merged to create the city of Asakura 朝倉市. “Batabata Ichi” is the first bazaar of the new year at Mt. Kanboku’s Anchoji Temple. The tradition is said to have started with the bartering fair begun by imperial estate administrator and founder of Anchoji Temple, Amagi Yasunaga (for whom the region was also named), while the name “Batabata Ichi” is rumored to have come from the name for a spinning drum toy (“Amagi batabata”) that was sold on the temple grounds and supposedly warded off smallpox. Toy drums are still sold today and come in two patterns (the faces of a young boy and a young girl), which are customarily bought as a set. Even now when the fear of smallpox has been virtually eliminated, many people praying for their child’s healthy growth buy them!
. 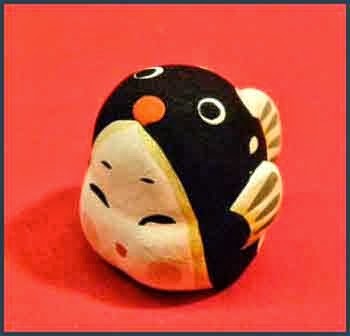 Japanese Drums - Introduction .
. ebi　えび　/　海老　/ 蝦 lobster, prawn, shrimp dolls. Although Hakata may have undergone a drastic change over the years, the people’s hearts remain the same. The open and unconventional Hakata temperament has been passed down together with many festivals and traditions, making Hakata a hometown beloved by the people that live here. The life and culture of Hakata, mainly of the Meiji and Taisho eras, are introduced from various perspectives at this Museum. Enjoy for an exploration into the heart of Hakata.
. Hakata semi dako 博多せみ凧 kite like a cicada . Many other items of continental culture entered Japan through Hakata. 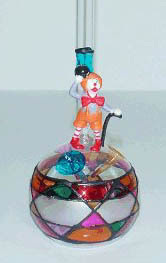 For instance, the city is also famous for its arts and crafts, many of which originated in the continent. Hakata’s famous textile tradition, known as Hakata-ori, dates back to a young tradesmen who accompanied Shōichi Kokushi to Song China and brought knowledge of Chinese weaving techniques back with him to Japan. 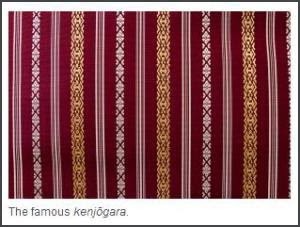 The most famous of all local fabric patterns is kenjōgara, which was originally a special high-quality silk woven as an official gift for “presentation” (the meaning of the word kenjō) to the Tokugawa shōguns. 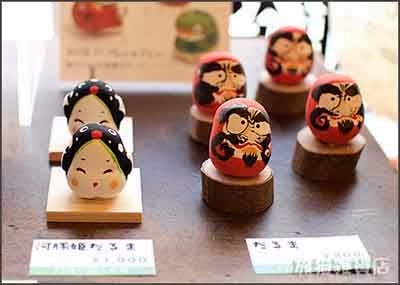 Not far from the temples, the Hakata Traditional Craft Center displays some of Hakata’s best traditional arts and crafts. Naturally, Hakata-ori is one of the main exhibits. 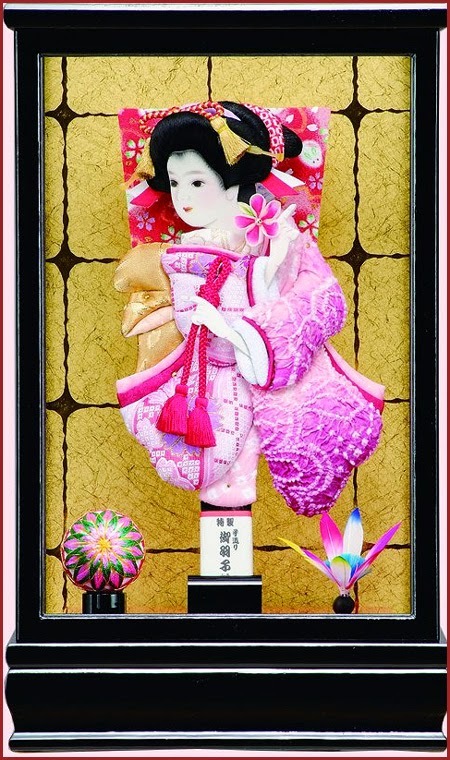 “Hakata-ori is prized for the softness of its silk. This makes Hakata-ori the fabric of choice all over Japan for the obi sash worn with a traditional kimono,” says staff member Sakaguchi Yūri. Each of the elements used in the kenjōgara pattern has a special significance. The intricately woven lines use votive items found on a Buddhist altar as a motif. Thicker lines are thought to represent parents, while the thinner lines are compared to children. “Where the thicker lines surround the thinner ones, we say that the parents are watching over their children,” says Sakaguchi. “When it’s the other way round, we say the children are now looking after their parents in their old age.” The colors of the designs also draw on Chinese cosmological and philosophical traditions. Purple represents virtue; blue is for benevolence; red stands for ritual propriety; yellow for honesty; and navy blue for wisdom. Visitors can watch Hakata-ori weavers at work at the Hakata Machiya Furusato Kan, a museum dedicated to the living history and traditions of the local area. The museum stands in a renovated traditional building that originally served as the living quarters and workshop of a Hakata-ori weaving family around the turn of the last century. One of the weavers is Takiguchi Ryōko, a young woman who left her job as an office worker to fulfill her dream of working in arts and crafts. “The large number of vertical warp threads used in the cloth is one of the distinctive qualities of Hakata-ori,” she explains. ”It’s the interplay between the warp and the weft that creates these beautiful patterns.” Visitors have the opportunity to try their hand at weaving a cloth of their own. But it would take many years of painstaking practice to attain anything like Takiguchi’s marvelous dexterity and mastery of her craft. Thanks to the dedication and skills of Takiguchi and others like her, Japan’s craft traditions have a bright future in Hakata, where so many of them began.
. Hita 日田市 - Bungo no Kuni Hita 豊後国日田 . Kitakyushu is famous for its various types of kites which have to resist the strong winds of the season.
. magojidako, Magoji-dako 孫次凧 Magoji kite . Koishiwara-yaki, deriving its name from a town in Fukuoka, Kyushu, is a traditional Japanese pottery that has been loved by general public for everyday use. Unlike the lavish and colorful Arita and Imari porcelains, both from Kyushu, which charmed Europe and the world when first introduced at the end of 17th century, Koishiwara is known for its homely warmth of clay. Its origin dates back to the early stage of Edo Period (1603-1868) when the lord of Kuroda Clan invited potters from Imari to produce fine porcelains. Then, at the beginning of 18th century, unknown craftsmen began making the daily earthenware that Koishiwara-yaki is today. Its practical yet distinctive design has since been lauded as the you no bi (beauty in utility). Koishiwara Pottery, a totally new brand of Koishiwara-yaki, was launched to aim for the new Japanese Mingei modernism.A collaboration between Tokyo-based food coordinator Tomoko NAGAO and potters in Koishiwara, and under the concept “Tableware to Enhance Your Meals”, we’ve been creating modern tableware that goes with any kind of cuisine. This fine lacquer ware, which uses only long-jointed bamboo from Kyushu, is characterized by its elegant gloss and refinement. 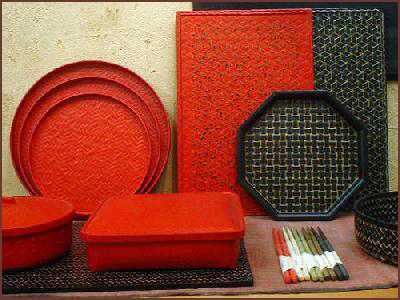 The bamboo ware is available in many varieties, ranging from chopsticks, coasters, baskets to chairs. The technique whereby bamboo strips are woven into shapes and coated with lacquer. Also called kagoji 籠地 (basket base) when a basket is made with peeled bamboo or vines and lacquered. 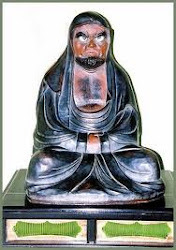 Made in Han period China and late Jomon period Japan, there are examples in the Shosoin 正倉院. It is still made in Thailand and Burma and, in modern Japan, in Takamatsu 高松 Kagawa prefecture, Kurume 久留米 Fukuoka prefecture, and Beppu 別府 Ooita prefecture. Rantai lacquer ware is the traditional lacquer ware made in Kurume City, Fukuoka Pref. 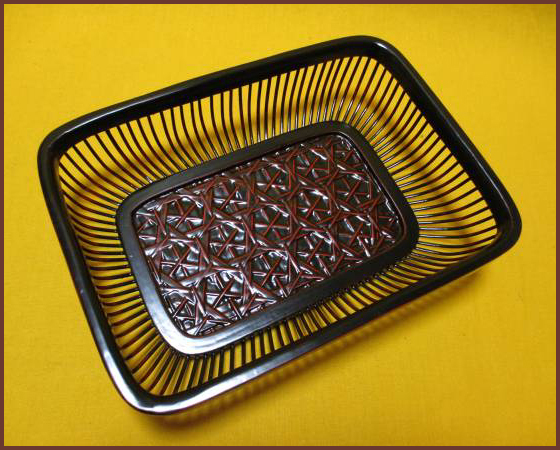 In Rantai lacquer ware, lacquer is applied many times to a bamboo basket. Then the lacquered basket is polished up and given decorations to finish. The word “rantai” literally means the lacquer ware which has a bamboo basket inside. The technique of making such lacquer ware was already seen in the excavated articles of the Jomon period, but the present style of making Rantai lacquer ware was established in the early Meiji period, and it is said that the name “Rantai” began to be used since the middle of the Meiji period. 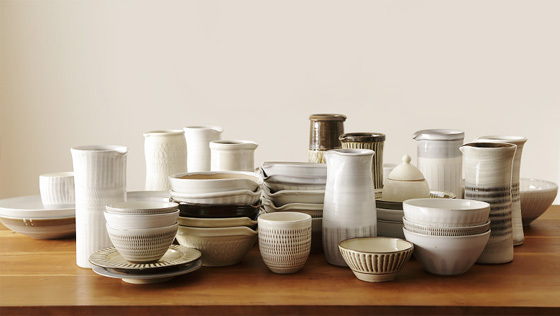 This lacquer ware is elegant and light in weight, but lasting and acid / alkaline resistant. It increases its beauty and takes on refined taste as you use it longer. 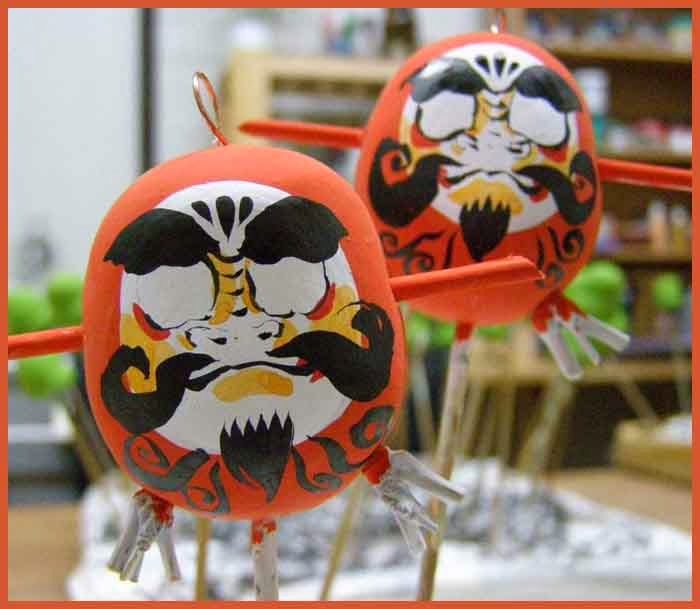 At the present this lacquer ware is produced only in Kyushu District.
. Chikuzen Bunbun-Dako 筑前ブンブン凧 humming kite from Chikuzen .
. WKD : 八朔 Hassaku celebrations . 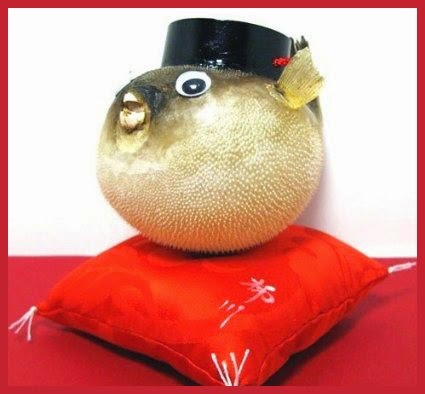 The town is closer to Saga.
. Saga Folk Art - 佐賀県　.
. fugu 河豚 blowfish, pufferfish - Spheroides fam. .
. Yanagawadako 柳川凧 kites from Yanagawa town . Yame is a town best known for its green tea - Yamecha　八女茶 . 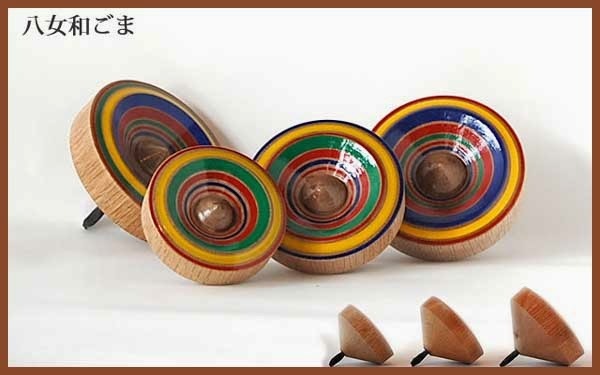 Woodcraft workers have been making these tops since the beginning of the Meiji period until just before WWII. Now there is just one workshop to make them.
. . . a somewhat flat spinning top called the Yamegoma. One of the characteristics of the Yamegoma is the belly button top! According to Mr. Kazunobu Kumamoto, a 6th generation maker of koma, "I want to continue to grow my ability to make new tops”. 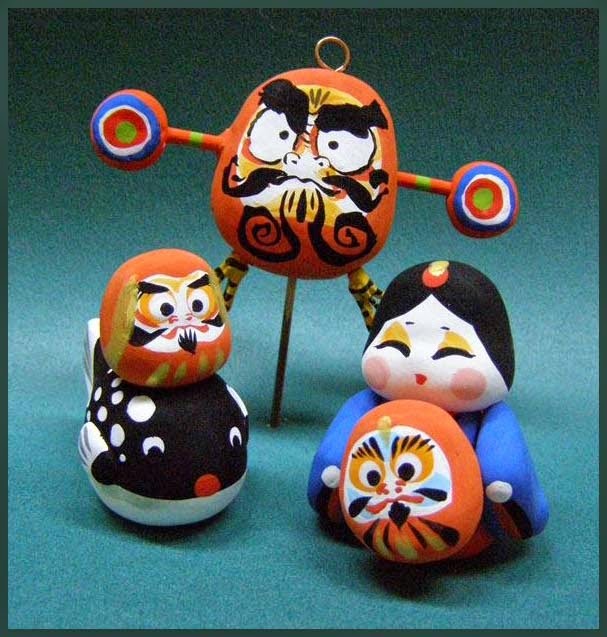 Mr.Kumamoto throws himself at his work by using the skill and techniques of making koma and wooden toys passed down to him. There are many young fans who appreciate Mr.Kumamoto’s immense skill and refined designs. ”I don’t concern myself with superficial designs. I make these tops for children. I choose the best materials, and spend an incredible amount of time polishing the tops until I think they are of the highest quality. The Yamegoma has a pin of metal and the side is bent outside just a bit, with the middle curved inside. They have the form almost of a bead for a soroban ソロバン玉 abacus calculator.
. 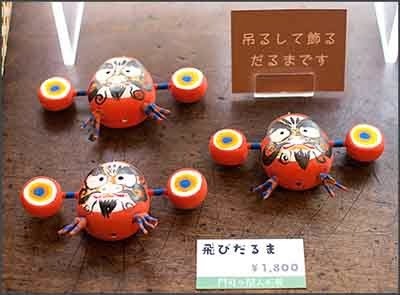 Spinning Top 独楽（コマ） koma .
. Ehamadoo 絵羽馬堂 Ehama Do - Papermache Dolls .
. Hikosan no garagara 英彦山のガラガラ clay bell against insects .
. Kites from Kyushu　九州の凧　- Introduction .
. Fukuoka Folk Toys - this BLOG .